Stakeholders lack a mutual understanding of the nature of the situation. Strategy – especially the early activities of environmental scanning and selecting core challenges – involves substantial ambiguity, complexity, paradox, and uncertainty. Much of this ambiguity arises in the organization’s external situation and requires acuity and sensitivity to the underlying structure to accommodate it. There is complexity that is internal, too, as all large organization have silos of expertise that are not understood by others outside that silo. The organization’s social and emotional environment is not supportive for individuals to step outside of their comfort zone. Strategy requires stakeholders to willingly make an investment, despite the uncertain outcomes: it requires commitment. Both of the above problems are generally related to communications, and more specifically to the conversations that people have with each other. Most of the time, in most organizations, the conversations that take place involve low-meaning exchanges: events, tasks, gossip about people, and complaints. Take a look at your emails and texts and see how much meaningful information is really there. I have found a useful way to introduce groups to effective conversations about strategy and execution. It uses an analogy that is familiar to most people from western cultures. Dialogue involves active use of inquiry to understand the perspective of others and advocacy to present their mental model about the situation and the solution. Listening is key, so that the voices of important stakeholders about the evidence and the narratives that connect the evidence. Dialogue goes deeper than words, it is an attempt to discover and agree to underlying meanings. What is the core challenge of the organization? What resources have the most power to “tilt” the system in the desired direction? Deliberation builds upon dialogue. People deliberate by using their reasoning skills for the purpose of making collective decisions. Deliberation is not rushed. 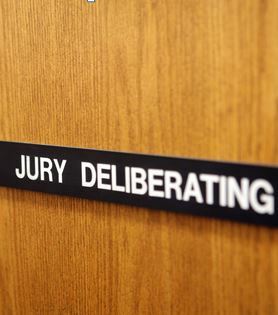 Now, let’s examine how to apply jury duty analogy to strategy discussions. The first phase is selecting the core team, just like we would select the jury. The ideal core team member is someone who is both competent at strategic thinking, and has organizational power and influence. We need to let them know that activity will require a commitment of their time, and will require them to focus their attention. Here is a subtle-but-important point: although we are inviting people to a meeting, we are most importantly inviting them into the conversation. We are inviting them to engage in a sharing of mental models where each will be influencing, negotiating, and visioning. I recommend addressing the ambiguity around the words “strategy,” and all of the phrases that use the word “strategic” as a modifier (e.g., strategic initiatives, strategic goals, strategic plans, strategic decisions). Even if the person has had training in strategic thinking and strategy, there is likely to be numerous opinions. Regardless of the definition you might be using, we are talking about something important. Because of the significance of strategy, we need to recognize the users of dialogue and deliberation must transcend casual talk about events and tasks, and opinions. The tendency of many – in the face of complexity – is to simplify it. It seems rational to break things into pieces, but it can cause problems when addressing problems involving people and culture. The better approach for complexity in strategic initiatives is to accept it and adapt to it. By doing so, you will be more likely to find coherence in your strategy. The second phase of a jury trial is the presentation is the argumentation phase. Here the jury is exposed to the evidence and the explanations of the evidence. They are counseled to avoid prejudices. Just like the narrative in a jury trial is a hypothesis to be tested, a strategy is a hypothesis. The jury’s job is to figure out if the hypothesis fits the evidence. In an earlier article, I explained that solutioneering (proposing solutions before problems are understood) is a common problem for strategic initiatives. Solutioneering is a prejudice for a certain solution, and it can lead to mediocre strategy. Solutionering is most often a person’s opinion based on their world view, and you can mitigate it with attention to dialogue and deliberation. The third phase of a jury trial is deliberation. Similarly, if you have a point of view to advocate, use the ladder of inference to climb up from your data to your recommended strategy. An effective jury reaches consensus. Similarly, and effective strategy is one that reaches consensus; that is, people agree to support the implementation. The stakes are high in a jury trial, and the stakes are high in strategy. Do you agree that the jury analogy provides some useful ideas for improving strategy implementation? This entry was posted in Strategy Coaching and Facilitation, Useful Practices & Management Tools and tagged ambiguity, collaboration, Decision making, Stakeholder (corporate), strategic initiatives, strategic thinking, strategy discussions, strategy execution. Bookmark the permalink. Great article and timely as I am being drawn into a new strategy effort at Hershey. I will need to be continuing to remind everyone the high level is not necessarily the end game and the Conversations – Mental Exchange is the key.